Climbing trees, playing with wool... Matilda is sure her cat will love these things, but he doesn't seem very enthusiastic. Undaunted, she thinks up new ways to amuse her reluctant playmate. Tea parties? Dressing up? Or what about a nice bike ride? As the beleaguered cat goes from nonplussed to terrified, Matilda gets more and more frustrated. After all, what use is a pet if it doesn't want to play? 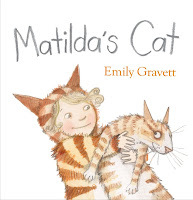 What can I say…I am a huge Emily Gravett fan, she would be in my Top 3 picture book writers and illustrators! So when a new Emily Gravett comes in, I am a happy girl. To me a book that is so simple, and can still tell a good story is something to jump up and down about. So many picture books are being released that are so deep and meaningful, that they aren’t written for children at all, but this one will be perfect for any young readers, even more so if that younger reader is a cat lover. Matilda is obviously one such cat lover, as not only does she have a lovely ginger cat, but she is dressed like one too. Matilda thinks that there are lots of things that her cat should love to do, and on each page these things are listed…and then crossed off…because Matilda’s cat doesn’t seem to like any of the things that she should. Some of the things are understandable, like tea parties and bike riding, but some very cat type activities like playing with wool and climbing trees are still crossed off the list. There are all sorts of little details that you notice in the illustrations when you start to look, things that show Matilda’s love of cats. She has a cat on her teapot, on her hat and her bike, and all of her pictures feature herself and a very familiar looking ginger cat. As bedtime approaches however, we do see that her affection may be shared with a love for dogs also, as she reads a book about Dogs (now that is a familiar book! ), had terriers on her pyjamas, and puppy dog slippers!